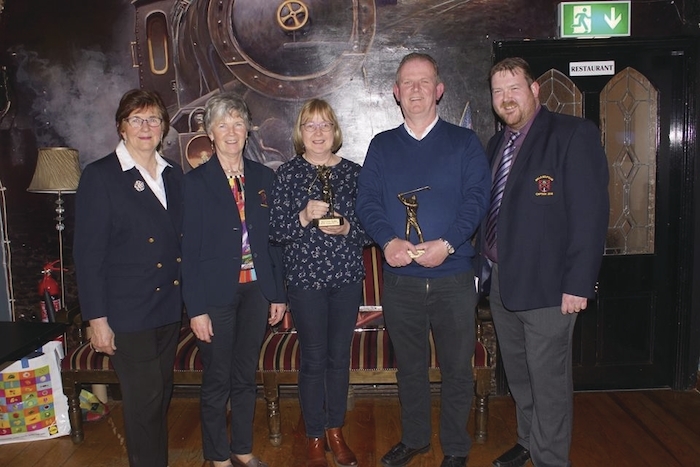 The top lady scorer in the Balla Winter League, Breege Jennings, and the top gents' scorer, James Waldron, at Balla Golf Club - with club officers, Julie Loftus, Carmel Henry, and Paul Murtagh. The weather is turning for the better and the scoring is getting better in the clubs around the county. Last weekend's gents' stableford competition was won by Ronan Mahon with a score of 40pts, he finished one point in front of second placed finisher PJ Brett with Derek Reilly another point back in third place. The ladies' competition was won by Julie Loftus with a score of 34pts, she finished one point in front of Nora Heraty in second place with Mary B O'Donnell coming home in third place. The Wednesday scramble was won by the trio of John Hyland, Michael Neary, and Ronan Mahon, second place went to Paraic Cuffe, Carmel Henry, and Bernie Burke, and third place was claimed by Stephen Minogue, Geraldine O'Malley, and Maureen McDonnell. Paul Hickey was the winner of last weekend's gents' competition with a score of 67 net, Shane Buckley finished in second place, and Patrick Joseph Moran was the gross prize winner. The ladies' competition was won by Mary Kelly with a score of 72 net, with Laurena Freeley finishing in second place with a score of 74 net. The winner of last weekend's gents' competition was Monty McLoughlin with a score of 44pts, he finished four points in front of the second placed finisher Henry Bourke and Padraig Moran finished in third place. The ladies' stroke competition was won by Mary Daly - who scored 77pts for her round, second place went to Connie D'Arcy with Breege Costello finishing in third place and Pat McDermot in fourth. The front-nine competition was won by Dairine O'Leary and Bernie Divilly was the back-nine winner. The gents' stroke play competition was claimed by Jonathan Burke - who shot a score of 70pts, Alan Flannery finished in second place with Ger Fahy taking third place. The gents' open Friday competition was won by Enda Staunton who saw off Mike Fahy into second place on countback after both men finished with a score of 40pts. The ladies' competition in Castlebar was won by Dolores Towey with a score of 38pts, she finished two points in front of Breege Finnerty in second place. Terri Fahy came home in third place and Ger Lyons took fourth spot. The club 14 hole Stableford competition was won by Margaret Kennedy with a score of 30pts, with Finola Lynn claiming second place. The 2018 Cáirde Mhaigh Eo golf classic takes place in Claremorris Golf Club oh Friday, May 11, and Saturday, May 12. Teams of four cost €200, it promises to be a great weekend with great prizes on offer as part of the build up to Mayo v Galway game on Sunday, May 13. Prizes on offer over the weekend include All-Ireland final tickets, hotel stays, vouchers, and Mayo merchandise. The gents' 18-hole Stableford competition was won by Declan Healy with a score of 41pts, Gerry Ronayne finished in second place on 38pts and Brian Gallagher came home in third place a further point behind. The ladies' nine hole scramble was won by Ann Prendergast with a score of 18pts, with Patricia Feeney finishing in third spot.